• There will be a severe correction in the objectives with which people were launching TV channels. Many players were getting into this business not because they had a great content idea or business model, but simply because they could, riding on the financial liquidity in the economy. • Efficiencies are going to be put to an extreme test. A high level of efficiency will be expected of everyone since cash will be in short supply. The good fallout of this is that there will be plenty of innovation. There will be better ideas and innovative content, all of which will benefit the viewer. I think viewers can expect better content on their TV screens in 2009. • The predominant philosophy of the television business during the past few years was—bigger is better. On content, this meant a rush for bigger shows, bigger stars and big names all around, with little thought to the quality of content. On business, the more expensive option came to be regarded as the better option. If you demanded a high salary, people presumed you would be good. All these will be a thing of the past simply because it hasn’t worked. People will have to get used to working in a resource-scarce environment. Creative and business excesses will end. • There will be a correction in the runaway salaries many undeserving people in the media are being paid. The infantry brigade of the media world, those without unique skill sets who came to be paid so much solely due to the demand and supply situation, will have to moderate their expectations. Genuine talent, however, will continue to be wooed with attractive compensation. • We will see a much larger play of technologies driving efficiency. Media in India, with the exception of news and sports to an extent, employs obsolete technology, which in turn results in inefficient use of resources. Again, cost considerations will mean that small innovative technology will win over big-branded technology. Small IT players are better placed to provide innovative and customized solutions and we will see media firms taking these cost effective solutions seriously. • There will be consolidation in the media space. True entrepreneurs will be separated from fortune hunters. I think we can hope to see some consolidation in the second half of 2009. They would intensify their efforts to dent its credibility. Much of it is bogus, surrogate arguments for control. Media needs to be watchful of both these threats and its own conduct that prompts these threats. • Politicians will redouble efforts to infiltrate media ownership. Politicians, parties and affiliated groups will try to enter broadcasting and distribution businesses in an effort to mould public opinion during a year when many important political events are set to take place. This is also because they are well aware of and scared of what independent news media can do. This trend is already seen in states such as Punjab, Andhra Pradesh and Tamil Nadu and will intensify during 2009. • In the distribution business, I don’t see a big push into digitization of cable. Cable will continue to drive the spread of television into rural areas. DTH (direct-to-home) will grow aggressively. The numbers will grow, but the players will continue to lose money, thanks to government policy and their own business model. • The economics of most players, except the market leaders across segments, will come under tremendous pressure. • There will be a quality push in regional media. National media space is already crowded and fragmented, so new entrants might prefer the regional media landscape and will compete there with quality content. • Investments in the media space will definitely slow. New launches will be few and far between and the appetite for large global media firms for investments and acquisitions in India will also be under pressure. This will of course be worsened by a lack of initiative from the government to maintain a robust investment ecosystem for the media space. As told to Sruthijith K.K. 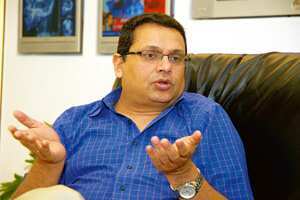 Uday Shankar is chief executive of Star India Pvt. Ltd, a broadcast network owned by News Corp. This is the fourth of a nine-part series. Tomorrow: Living Media India CEO Ashish Bagga talks about the print industry.